Thank you, Neville Hobson for highlighting this excellent video which explains the social media guidelines drawn up by the department of Justice in Victoria, Australia. It gives sound advice and very well made presentation. It is hard to think of an organisation that wouldn't benefit from watching this. Although they don't do it very well, football clubs still seem particularly keen to try and keep clinging on to vanished notions of 'command and control" PR. Only this week The Guardian was banned from covering Leeds United match because one of its reporters asked a question the chairman didn't like. ﻿"....it's the players, through Twitter and such like, who have brought back the sense of connection between footballers and fans that for so long was held up by journalists as an example of the "you and them" scenario that developed when money began to flood into the game and, in turn, players' wages increased out of all proportion with the man in the street. "This connection, albeit through the internet, is hugely important and because of it we must not allow social networking to become a dirty phrase. For this generation, Twitter and Facebook offer a wonderful opportunity to follow almost any player you like and interact with them." I am about to start teaching three MA and BA modules in social media, and all will include significant amounts of hands-on practical work. As Bernie Goldbach observed, there's really no other way to do it. One of the challenges is that, unlike most university assessments where there is pressure to blindmark, and students can expect a high degree of confidentiality in feedback, social media assignments are by definition played out in public, with flaws, weaknesses and sometimes plain stupidity on show for all to see, cache and index forever. One of the reasons I am keen to add Louis Halpern and Roy Murphy's book, Personal Reputation Management: Making the Internet Work for You (2009, HalpernCowan) to the reading lists is that it constantly invites people to think about key issues of privacy and identity. From the outset it's worth pointing out that the authors need a lot of white space, design creativity and none-too-stringent editing to break the 200 page barrier; the important bits could be delivered effectively in a much shorter and more focused way. At the same time, this is a good book for dipping in to, and if the 'relaxed' format succeeds in making students think, all well and good. Halpern and Murphy start from the very reasonable position that "In the internet age, your personal 'brand' or identity is never off duty and your reputation is always 'switched on'. The internet is your 'reputation battleground'. They claim, with some justification: "Privacy is in the past. It's gone. It's history. "Imagine a scenario where every bad decision you made or every indiscretion was opened up for all to see. Scary thought? Welcome to the very connected world we now live in." Backed by examples ranging from the talk radio DJ outed as a BNP member to a man whose reputation was shredded by bad reviews on a dating site, they conclude: "Your reputation is in serious danger if you don't look after it." The problem is a lot broader than being caught doing bad things. If people look at what you knowingly and freelyhave posted, what will they conclude? "What facets of your personality are you consistently projecting? Are you friendly? Efficient? Dynamic? Do you get on with people?" It's a good point. I have several facebook friends who are always complaining about being stressed, moaning about being put up on by colleagues, habitually disorganised (me!) or perpetually unlucky or unwell. The authors recommend a reputation action plan, assessing the brand values you are associated with (whether you like it or not!) coupled with a reputation audit of all the platforms on whuich information about you apears. The goal is to achieve a positive, consistent message across all 'digital touchpoints" that acts as an "executive summary of you", which can be bolstered by projecting key phrases and words to show you in a good light and "to help clarify the best aspects of your brand." Perhaps this can go too far - as they say, "social media also allows a person to present an idealised version of themselves online." There is some truth in this, experience suggests that even the most scrupulous a few rough edges to show through. Where the book doesn't deliver surrounds strategies for cleaning up a bad reputation. They give a few ideas but reality is that reputations are fragile and even resorting to the law is only a partial solution. Anyway, Halpern and Murphy "foresee a time in the near future when reputation management classes will be taught at school's and universities." Well, that time is already here at Sunderland, and my students can expect to spend quite a bit of the coming semester working through the exercises in this useful and worthwhile book. PROpenMic, the Ning social network set up by Robert French, will soon have 500 members (including a good number who know each other from Euprera and EuroBlog). The platform is powerful - a more serious version of Facebook - and I am hoping it will be of real value to my students. It is early days and most people are still experimenting but it will be fascinating to see how it develops. Robert is working hard to bring in new members and again it will be interesting to see how many people can join without diluting its impact. Like everything else, it will be about content and value - the more that people get out of it, the more they will put in. Thanks to Penguin, I am reading an uncorrected proof copy of Here Comes Everybody: The Power of Organizing Without Organizations, which will be one of the most compelling and influential social media books of the year. 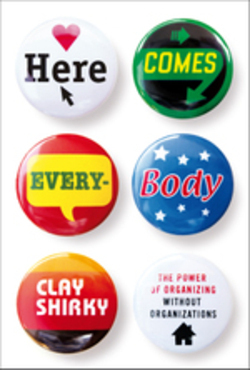 The improbably named Clay Shirky has done a splendid job of bringing together a wide range of themes into a highly readable whole that effortlessly manages to be much more than a sum of its parts. Shirky has a piercingly sharp eye for the spotting the illuminating case studies - some familiar, some new - and using them to energise wider themes. His basic thesis is simple: "Everywhere you look groups of people are coming together to share with one another, work together, take some kind of public action." The difference is that today, unlike even ten years ago, technological change means such groups can be form and act in new and powerful ways. Drawing on a wide range of examples Shirky teases out remarkable contrasts with what has been the expected logic, and shows quite how quickly the dynamics of reputation and relationships have changed. The thesis is not new but the achievement of Here Comes Everybody is in bringing together the argument in a focused and accessible way. Put simply, it is an exciting read that demands serious attention. (A Facebook group) is claiming victory in a battle with Sky Sports over where the live scores were displayed during Premiership matches. Almost 6,000 fans added their support to the campaign for the return of the "top left" score on Sky Sports after the broadcaster moved its live scores to the bottom left at the start of the season. But this weekend, as Chelsea lost to Aston Villa, the scores were back on the top left. The Kryptonite bike lock movie was a key event which made PR practitioners start to think seriously about the impact of blogging on organisational reputation. A couple of campaigns, aimed at Cadbury and HSBC, might well have similar significance for those who are trying to explore the implications of Facebook for reputation management. Cadbury is reintroducing the Wispa chocolate bar, apparently in response to Facebook groups like Bring back the Wispa (1,351 members, Aug 25) (BBC story: Web campaign prompts Wispa return); HSBC is under fire in groups such as Stop the Great HSBC Graduate Rip-Off! (2,621 members Aug 25) for its decision to charge interest on previously free student overdrafts (Guardian story: Now it's Facebook vs HSBC). "I'm leaving HSBC next week as well! We need to show them that they cannot just not keep their end of the bargain and get away with it! Its outrageous! I feel so cheated." "We need to warn new students to stay away from HSBC...would setting up a new group help? Opinions please!" The Wispa campaigners used a rather more direct PR technique when they joned a stage invasion during Iggy Pop's set at Glastonbury.